Independement settings of vacuum and exposure time with automatic memory function: The vacuum time and exposure time can be set up separately just according to actual requirements (setting ranges: 0-999 seconds); When exposure is finished, the power supply of the lamp will be automatically cut off, it will deflate and beep by itself, then please turn it off. When you need exposure again, just connect the power supply, then it will work automatically according to your former settings because of its automatic memory function. The high strength toughened glass (thickness: 0.24"/6mm) is with high press resistance and not easily scratched. Besides, once broken, it will turn into pieces without sharp edges to avoid user's injury. All-metal construction & elegant appearance with advanced electrostatic paintings, easy to clean and no rust. 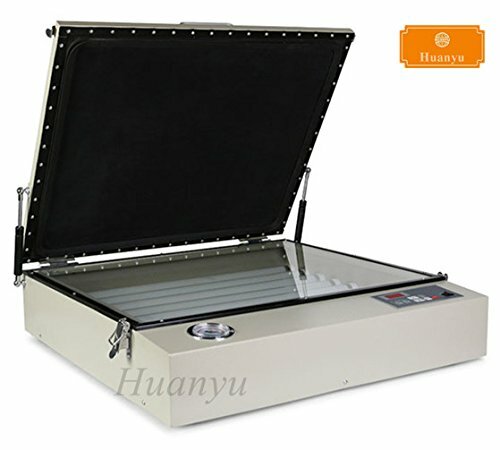 It is equipped with Vacuum Pump. When purchase, please confirm the product is from our Huanyu Instrument, otherwise we can't ensure the quality and after-sale service. 8 pieces of special UV exposure lamps will guarantee a precise and even exposure effect. The high strength toughened glass (thickness: 0.24"/6mm) is with high press resistance and not easily scratched.